The Military Religious Freedom Foundation (MRFF) was founded in 2005 by U.S. Air Force Academy graduate and Reagan administration White House counsel Mikey Weinstein, after the harassment his own sons faced as Jewish cadets at the Academy led him to discover that the fundamentalist Christian takeover of the Air Force Academy was far from an isolated problem. It was a military-wide issue that needed to be confronted head on. But it quickly became apparent that MRFF's initial mission of protecting the rights of our men and women in uniform was only addressing part of the problem. The evangelizing and proselytizing of Iraqi and Afghan Muslims by both private religious organizations and U.S. military personnel also had to be exposed and stopped -- particularly the materials and media available via the internet and television that could be used by extremists as propaganda for recruiting purposes. When MRFF began exposing some of what we were finding on the internet, Weinstein was contacted by two Bush administration national security officials, one civilian and one military, confirming that the kind of stuff we were exposing was, in fact, being used as fodder for propaganda, and urging him not to stop what MRFF was doing. The most astounding thing, as you'll see in the list below, is that it's not the private religious organizations who are most at fault in spreading the crusader message, but the U.S. military itself. As many will remember, we couldn't have gotten off to a better start on winning hearts and minds when Lt. Gen. William "Jerry" Boykin, on his speaking tour of churches back in 2003, publicly and in uniform proclaimed that the so-called war on terror was really a fight between Satan and Christians, making comments like, "We in the Army of God, in the House of God, the Kingdom of God have been raised for such a time as this," saying that George Bush, who himself had ignorantly called the war a crusade, was "in the White House because God put him there," and, referring to the capture of Somali warlord Osman Atto, "I knew that my God was bigger than his. I knew that my God was a real God, and his was an idol." Speaking at a Rotary Club meeting in his hometown of Concord, North Carolina in December 2006, one of Boykin's supporters in the aftermath of his comments, former Congressman Robin Hayes (R-NC), pronounced that stability in Iraq ultimately depended on "spreading the message of Jesus Christ, the message of peace on earth, good will towards men. ...Everything depends on everyone learning about the birth of the Savior." While few are as overt in their comments as Boykin and Hayes, plenty of other representatives of our government have made it clear that they view the United States as a Christian nation and the war on terror as a spiritual battle, promoting the specious notion that victory in Iraq and Afghanistan is somehow necessary to preserve our own religious freedom here in America. From members of Congress, like Trent Franks (R-AZ), who, in his remarks on the passage of H. Res. 847, a resolution "recognizing the importance of Christmas and the Christian faith,'' said that "...American men and women in uniform are fighting a battle across the world so that all Americans might continue to freely exercise their faith...," to the most recent Secretary of the Army, Pete Geren, who, in his commencement address at last year's West Point graduation, invoked the words of Thomas Jefferson, saying that Jefferson would understand the threat we face today -- tyranny in the name of religion." Geren quoted a few words from Jefferson's Virginia Statute for Religious Freedom, and then continued, "Two hundred years after Thomas Jefferson penned these words, your sons and daughters are fighting to protect our citizens and people around the world from zealots who would restrain, molest, burden, and cause to suffer those who do not share their religious beliefs, deny us, whom they call infidels, our unalienable rights -- life, liberty, and the pursuit of happiness." Neither Franks or Geren, nor anyone else who has suggested the war in Iraq is essential to the protection of the religious freedom of "our citizens," has offered any explanation of how the outcome of this war could possibly affect the free exercise of religion by Americans. While none were as widely publicized as those of Boykin, all of these statements, and many others like them, can easily be found on the internet. Hayes's Rotary Club meeting remarks, for example, after being published in a few North Carolina newspapers, were reported on the blog BlueNC, and quickly spread through the blogosphere, turning a speech at a local Rotary Club meeting into a national story. Lt. Col. Rick Francona, USAF (ret. ), when asked on MSNBC, "What's your reaction when you hear those words coming from a congressman?," explained why comments like these were such a problem. "Well, it's not helpful if this stuff gets back to the Iraqis, and of course in the days of the internet and the blogosphere out there it's likely that it could. And you know our troops have enough problems over there just doing their jobs. Having to defend what a U.S. congressman might say, because you know, when you bring up the idea of proselytizing Christianity, to a lot of Muslims, that's very offensive, and if we can keep religion out of what we're trying to do over there, which is very difficult, it would be a lot easier for our troops. ... When you've got a congressman saying that the country -- they're not going to solve their problems until they follow the ways of the savior, it becomes very difficult for the troops to defend those remarks. [...] If you're trying to be a unit trainer to, say, an Iraqi battalion and the battalion religious advisor, the imam, would come in and say look what a congressman said, it just takes away from what we're trying to do." When Air Force Maj. Gen. Pete Sutton decided in 2004 to appear in uniform at the Pentagon in the Campus Crusade for Christ Christian Embassy promotional video, a video full of government officials and high ranking military officers saying things like "we're the aroma of Jesus Christ," he probably didn't give any thought to the potential ramifications of publicly endorsing this fundamentalist religious organization. But, not long after appearing in this video, Sutton was assigned to the U.S. European Command, Ankara, Turkey, as Chief of the Office of Defense Cooperation. Here's what happened, according to the Department of Defense Inspector General's report on the Christian Embassy video investigation. "Maj Gen Sutton testified that while in Turkey in his current duty position, his Turkish driver approached him with an article in the Turkish newspaper 'Sabah.' That article featured a photograph of Maj Gen Sutton in uniform and described him as a member of a radical fundamentalist sect. The article in the online edition of Sabah also included still photographs taken from the Christian Embassy video. Maj Gen Sutton's duties in Ankara included establishing good relations with his counterparts on the Turkish General Staff. Maj Gen Sutton testified that Turkey is a predominantly Muslim nation, with religious matters being kept strictly separate from matters of state. He said that when the article was published in Sabah, it caused his Turkish counterparts concern and a number of Turkish general officers asked him to explain his participation in the video." In addition to the Christian Embassy video, MRFF has uncovered a slew of other videos of uniformed military personnel endorsing fundamentalist Christian organizations and military ministries, many of which have missions that include proselytizing Muslims. These videos are easily found on the internet, providing plenty of potential propaganda material for recruiting by extremists. As Gen. Norman Schwarzkopf recounted in his autobiography, It Doesn't Take a Hero, back in 1990, when U.S. troops were deployed to Saudi Arabia for Operation Desert Shield, an attempt by a Christian missionary organization to use the military to proselytize Saudi Muslims led the Pentagon to issue strict guidelines on religious activities and displays of religion in the region. It was left to the discretion of individual company commanders to determine how visible religious services should be, depending on their particular location's proximity to Saudi populations, and, in some cases, decisions not to display crucifixes or other religious symbols were made. There were a few complaints about these decisions, but the majority of the troops willingly complied, understanding that these decisions were being made for their own security. According to Gen. Schwarzkopf, even his request that chaplains refrain from wearing crosses on their uniforms was received an unexpectedly positive reaction, with the chaplains not only agreeing with the policy, but going a step further by calling themselves "morale officers" rather than chaplains. But now, in Iraq and Afghanistan, Gen. Schwarzkopf's common sense policies and priority of keeping the troops safe have been replaced by a flaunting of Christianity in these Muslim lands by Christian troops and chaplains who feel that nothing comes before their right to exercise their religion, even if it means putting the safety of their fellow troops at risk. 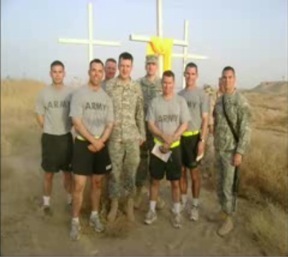 Numerous reports and photos received by MRFF, like the one below, as well as photos posted on official military websites, show conspicuously displayed Christian symbols, such as large crosses, being erected on and around our military bases in Iraq and Afghanistan. 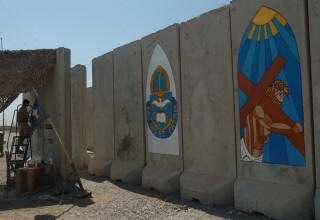 These large Christian murals were painted on the outside of the T-barriers surrounding the chapel on FOB Warhorse in Iraq. 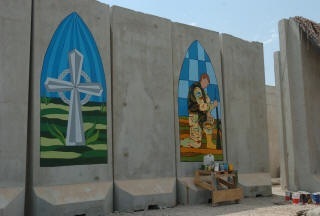 In addition to being a highly visible display of Christianity to Iraqis on the base, these photos were posted on an official military website. It is even more important that the Army regulation prohibiting displays of any particular religion on the grounds of an Army chapel, a regulation that protects the religious freedom of our soldiers by keeping chapels neutral and open to soldiers of all faiths, be strictly enforced on our bases in Iraq and Afghanistan. But, as these and other photos collected by MRFF clearly show, violations of this regulation that probably wouldn't even be tolerated on bases in the U.S. are not only tolerated but promoted on our bases in Muslim countries. 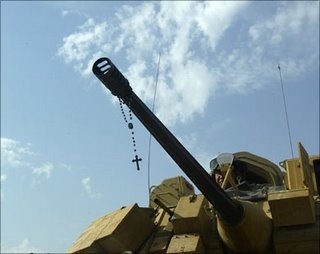 For those Iraqis who may not see the overt displays of Christianity on and near our military bases in their country, there have been plenty of mobile Christian messages, painted on our tanks and other vehicles that patrol their streets. The title of Jeff Sharlet's May 2009 Harper's Magazine cover story, "Jesus killed Mohammed: The crusade for a Christian military," actually comes from one such vehicular message -- the words "Jesus killed Mohammed" painted in large red Arabic lettering on a Bradley Fighting Vehicle, drawing fire from nearly every doorway as it was driven through Samarra. Other vehicles have sported everything from the Islamic crescent overlaid with the internationally recognized red circle and slash "No" sign to crosses hanging from gun barrels. 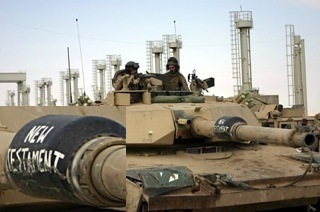 The photo below of the tank named "New Testament" was actually released by a military public relations office. Iraq is crawling with missionaries and evangelists, both civilian and military, who show little or no regard for laws or military regulations. Why? Because, in their opinion, the "Great Commission" from Matthew 28:19 -- "Go and make disciples of all nations" -- trumps all man-made laws. It's hard to find a military ministry whose mission statement doesn't, in one way or another, include fulfilling the Great Commission. Campus Crusade for Christ's (CCC) Military Ministry, for example, whose goal is to transform our enlisted trainees and future officers into "government-paid missionaries for Christ," is present at all of our military's largest basic training facilities, as well as the military service academies and ROTC campuses. The "Vision" of another organization, Military Missions Network, is "An expanding global network of kingdom-minded movements of evangelism and discipleship reaching the world through the military of the world." Organizations like CCC's Military Ministry could not succeed in their goals without the sanction and aid of the military commanders who allow them to conduct their missionary recruiting activities on their installations. And there is no shortage of military officers who not only condone, but participate in and promote, these activities. The Officers' Christian Fellowship, an organization consisting of over 15,000 officers and operating on virtually every U.S. military installation worldwide, which has frequently stated its mission to "create a spiritually transformed U.S. military, with Ambassadors for Christ in uniform, empowered by the Holy Spirit," has actually partnered with CCC's Military Ministry. "Responsibilities include working with Chaplains and Military personnel to bring lost soldiers closer to Christ, build them in their faith and send them out into the world as government paid missionaries." "The Valor ROTC cadet and midshipman ministry reaches our future military leaders at their initial entry points on college campuses, helps them grow in their faith, then sends them to their first duty assignments throughout the world as 'government-paid missionaries for Christ.'" A former CCC program director at the Air Force Academy, Scott Blum, said in a promotional video filmed at the Academy, CCC's purpose is to "make Jesus Christ the issue at the Academy" and for the cadets to be "government paid missionaries" by the time they leave. "We should never be satised with just having Bible studies of like-minded believers. We need to take seriously the Great Commission." All of the above quotes, as well as the video filmed at the Air Force Academy, were found by MRFF on the internet, which, of course, means that any extremist looking for recruiting tools could also find this proof that our military is being groomed to be a force of crusaders. "Young recruits are under great pressure as they enter the military at their initial training gateways. The demands of drill instructors push recruits and new cadets to the edge. This is why they are most open to the 'good news.' We target specific locations, like Lackland AFB and Fort Jackson, where large numbers of military members transition early in their career. These sites are excellent locations to pursue our strategic goals." "We must pursue our particular means for transforming the nation -- through the military. And the military may well be the most influential way to affect that spiritual superstructure. Militaries exercise, generally speaking, the most intensive and purposeful indoctrination program of citizens...."
The indoctrination of basic trainees at Fort Jackson, the Army's largest basic training installation, is a program called "God's Basic Training," in which the recruits are taught that "The Military = 'God's Ministers'" and that one of their responsibilities is "To punish those who do evil" as "God's servant, an angel of wrath." 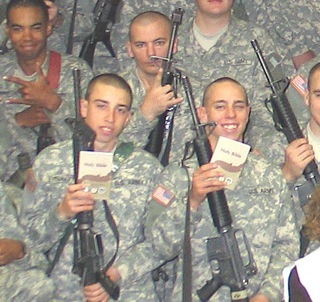 Until being exposed by MRFF and taken down, the Fort Jackson CCC Military Ministry had a website containing not only its Bible study materials, but numerous photos of trainees posed with their rifles and Bibles. This was not only allowed by the battalion commander, Lt. Col. Snodgrass, but was endorsed by Snodgrass by the appearance on the site of his own photo, posing with the Military Ministry director and battalion chaplain. In June 2007, Brigitte Gabriel, founder of the American Congress for Truth and author of Because They Hate, delivered one of her typical anti-Muslim lectures at the Joint Forces Staff College (JFSC). In February 2008, Walid Shoebat, along with his fellow self-proclaimed ex-terrorists turned fundamentalist Christians, appeared at the U.S. Air Force Academy's 50th Annual Academy Assembly. Gabriel's JFSC lecture, including the following quotes from the question and answer segment, was broadcast to the world on C-SPAN. "Absolutely. If a Muslim who has -- who is -- a practicing Muslim who believes the word of the Koran to be the word of Allah, who abides by Islam, who goes to mosque and prays every Friday, who prays five times a day -- this practicing Muslim, who believes in the teachings of the Koran, cannot be a loyal citizen to the United States of America." "A Muslim is allowed to lie under any situation to make Islam, or for the benefit of Islam in the long run. A Muslm sworn to office can lay his hand on the Koran and say 'I swear that I'm telling the truth and nothing but the truth,' fully knowing that he is lying because the same Koran that he is swearing on justifies his lying in order to advance the cause of Islam. What is worrisome about that is when we are faced with war and a Muslim political official in office has to make a decision either in the interest of the United States, which is considered infidel according to the teachings of Islam, and our Constitution is uncompatible [sic] with Islam -- not compatible -- that Muslim in office will always have his loyalty to Islam." "Those Al Qaeda members and Hezbollah members who are coming into the United States, they are immediately going from the Mexican border into the major cities where there is large Islamic concentration in the United States, such as 'Dearbornistan' Michigan..."
"We need to see more patriotism and less terrorism, and especially on the part of the Islamic community in this country, who are good at nothing but complaining about every single thing instead of standing up and working with us in fighting the enemy in our country." Just as outrageous as Gabriel's JFSC lecture was the February 2008 appearance of the "three ex-terrorists" at the U.S. Air Force Academy. The three members of this traveling anti-Muslim sideshow, Walid Shoebat, Zachariah Anani, and and Kamal Saleem, whose claims about their exploits as Muslim terrorists have long been questioned by academics and terrorism experts who have found a plethora of unlikelihoods and outright impossibilities in their stories, were featured speakers at the 50th Annual Academy Assembly on the topic "Dismantling Terrorism: Developing Actionable Solutions for Today's Plague of Violence." Shoebat has also spoken at Tim LaHaye's Pre-Trib (Pre-Tribulation) Research Center conferences and John Hagee's Christians United for Israel (CUFI) events. Zachariah Anani is a Lebanese-born Canadian citizen who claims to have killed 223 people while a Muslim terrorist. Kamal Saleem, under his real name, Khodor Shami, worked for Pat Robertson's Christian Broadcasting Network for sixteen years, was hired by James Dobson's Focus on the Family in 2003, and founded Koome Ministries in 2006 to "expose the true agenda of [Muslims] who would deceive our nation and the free nations of the world." Brigitte Gabriel's anti-Muslim screed at the JFSC eventually ended up on YouTube, and articles about the ex-terrorists' Air Force Academy presentation, which included things like Walid Shoebat's pronouncement that converting Muslims to Christianity was a good way to defeat terrorism, also ended up online, providing plenty of proof that the U.S. military's training includes teaching cadets, officers, and senior NCOs that Islam is evil and must be stopped. Travel the Road, a popular Christian reality TV series that airs on the Trinity Broadcasting Network (TBN), follows the travels of Will Decker and Tim Scott, two "extreme" missionaries who travel to remote, and often dangerous, parts of the world to fulfill their two part mission to "1. Vigorously spread the gospel to people who are either cut off from active mission work, or have never heard the gospel," and "2. Produce dynamic media content to display the life of missions, and thus, through these episodic series electrify a new generation to accomplish the Great Commission." Season two of the series ended with three episodes filmed in Afghanistan. To film these episodes with the aid and participation of the U.S. Army, the TV show missionaries were permitted to be embedded with U.S. troops as "journalists." They stayed on U.S. military bases, traveled with a public affairs unit, and accompanied and filmed troops on patrols -- all for the purposes of evangelizing Afghan Muslims and producing a television show promoting the Christian religion. The Department of Defense Public Affairs regulations violated by the military in its participation and assistance in producing this religious program alone are staggering, not to mention the regulations governing embedded journalists, the laws of Afghanistan, and other military violations documented in the content of the program, which included an outrageous violation of the CENTCOM's General Order 1-A, which absolutely prohibits any proselytizing whatsoever in the Middle Eastern theater of operations. In complete disregard of this bedrock standing order, the U.S. Army facilitated the evangelizing of Afghans by these Christian missionaries, which included the distribution of New Testaments in the Dari language, one of the two official languages of Afghanistan. According to ABC News Nightline, which did a segment on the missionaries after MRFF first exposed that the Army had allowed them to be embedded and aided them in their mission, "Decker and Scott said the military was aware of the purpose of their trip." In the interview Scott stated, "They knew what we were doing. We told them that we were born again Christians, we're here doing ministry, we shoot for this TV station and we want to embed and see what it was like." While the Army's participation in the Travel the Road program, which, according to a Travel the Road publication, is viewed by more than three million people worldwide, is the most incredible example of the stupidity of broadcasting to the world that the U.S. military was aiding missionaries who were trying to convert Muslims, it is far from the only example. On September 10, 2008, the Discovery Channel's Military Channel aired a two-hour program titled God's Soldier. Filmed at Forward Operating Base (FOB) McHenry in Hawijah, Iraq, the program's credits say it was "Produced with the full co-operation of the 2-27 Infantry Battalion 'Wolfhounds.'" The co-producer of God's Soldier was Jerusalem Productions, a British production company whose "primary aim is to increase understanding and knowledge of the Christian religion and to promote Christian values, via the broadcast media, to as wide an audience as possible." Bible verse text captions appearing between segments of this two-hour program, which focused on a evangelical Christian chaplain, Capt. Charles Popov, included "I did not come to bring peace, but the sword" and "Put on the full armor of God so that when the day of evil comes, you may stand your ground." "I pray that you would give them the ability to exterminate the enemy and to accomplish the task that they're been sent forth by God and country to do. In Christ's name I pray. Amen." "Every soldier should know Romans 13, that the government is set up by God, and the magistrate, or the one who wields the sword -- you have not swords but 50 cals and [unintelligible] like that -- does not yield it in vain because the magistrate has been called, as you, to execute wrath upon those who do evil." The scene that tops them all, however, is one in which Chaplain Popov is setting up a nativity pageant for Christmas -- using the unit's Iraqi interpreters to play some of the roles. Popov describes this as some sort of cultural exchange, with U.S. troops recognizing Ramadan, and Muslim interpreters, in turn, celebrating Christmas. The stupidity of this is astounding. U.S. soldiers participating in a Muslim religious observance are not risking death by doing so, while Muslims, in a country where many consider converting to Christianity a death penalty offense, are. Broadcasting to the world via the Discovery Channel that U.S. Army personnel were putting Muslims in a Christmas pageant is absolute insanity, and couldn't be a better recruiting tool for extremists. What better way to say to Muslims that the U.S. military is not officially Christian than to have official U.S. military emblems stamped on hundreds of thousands of Bibles floating around Iraq and Afghanistan? Over the past few years, MRFF has amassed quite a collection of military Bibles -- some produced by private organizations and others officially authorized by the military -- prominently sporting the seals of the various branches of the military and other official military emblems. 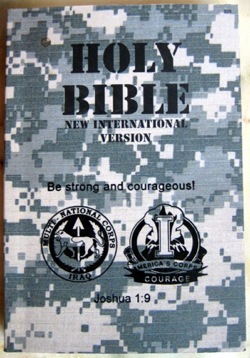 The latest addition to the collection is a photo from an officer serving in Iraq, who emailed this photo of a Bible being distributed in Iraq with both the Multi-National Corps - Iraq and I Corps seals imprinted on its cover. And, it isn't just Bibles. Chief Warrant Officer Rene Llanos of the 101st Airborne Division, referring to a special military edition of a Bible study daily devotional published and donated by Bible Pathways Ministries, told Mission Network News that "the soldiers who are patrolling and walking the streets are taking along this copy, and they're using it to minister to the local residents," and that his "division is also getting ready to head toward Afghanistan, so there will be copies heading out with the soldiers." Just like the many civilian missionaries who see the wars in Iraq and Afghanistan as a window of opportunity to evangelize Muslims, Llanos continued, "The soldiers are being placed in strategic places with a purpose. They're continuing to spread the Word." This daily devotional, admittedly being used by the 101st Airborne Division "to minister to the local residents," has the official military branch seals on its cover, giving the impression that it is an official U.S. military publication. And, while these logos are sometimes used without permission, and may have been on this particular book, the Iraqis and Afghans don't know that. Then there are the Bibles sporting the official military logos that actually were produced with the permission of the Pentagon, one of them designed by the Pentagon chaplains. Revival Fires Ministries, "at the request of the Chief Chaplains of the Pentagon," has been shipping these Bibles to Iraq, via military airlift, since 2003, and, according to a ministry press release, this "full Bible is designed and authorized by the Chief Chaplains of the Pentagon." "We must let the Muslims, the Hare Krishna's, the Hindu's, the Buddhist's and all other cults and false religions know, 'You are welcome to live in America...but this is a Christian nation...this is God's country! If you don't like our emphasis on Christ, prayer and the Holy Bible, you are free to leave anytime!'" Worse than any English language Bibles, even those stamped with official U.S. military emblems, are the countless thousands of Arabic, Dari, and Pashtu Bibles making their way into Iraq and Afghanistan, often with the help of U.S. military personnel. In his autobiography, It Doesn't Take a Hero, Gen. Schwarzkopf recounted his run in with Franklin Graham's organization, Samaritan's Purse -- an incident that made it clear that the Saudis' fears and complaints of Christian evangelizing were not unfounded. While some of the Saudis' fears, as the general explained, had resulted from Iraqi propaganda about American troops disrespecting Islamic shrines, the attempt by Samaritan's Purse to get U.S. troops to distribute tens of thousands of Arabic language New Testaments to Muslims was real. "The Saudi concern about religious pollution seemed overblown to me but understandable, and on a few occasions I agreed they really did have a gripe. There was a fundamentalist Christian group in North Carolina called Samaritan's Purse that had the bright idea of sending unsolicited copies of the New Testament in Arabic to our troops. A little note with each book read: 'Enclosed is a copy of the New Testament in the Arab language. You may want to get a Saudi friend to help you to read it.' One day Khalid* handed me a copy. 'What is this all about?' he asked mildly. This time he didn't need to protest -- he knew how dismayed I'd be." *Lt. Gen. Khalid Bin Sultan al-Saud, commander of Saudi Arabia's air defense forces, appointed by King Fahd as Gen. Schwarzkopf's counterpart. This was the incident that, as mentioned above, led to the implementation of strict guidelines on religious activities of military personnel. As also mentioned above, the adherence to and enforcement of regulations clearly aren't what they were back then. Converting the Iraqis and Afghans is a pet project of numerous private organizations (some with the help of the military), as well as military personnel and military organizations. Some missionaries even take jobs with DoD contractors to gain access to the Iraqi people. All have found ways to circumvent the prohibitions on sending religious materials contrary to Islam into the region. There are literally thousands of people involved, and hundreds of thousands of Arabic and other native language Bibles, tracts, videos, and audio cassettes have made their way into Iraq and Afghanistan, along with Christian comic books, coloring books, and other materials to evangelize Muslim children. A recent Al Jazeera English news report showed U.S. troops at Bagram Airfield in Afghanistan discussing the distribution of Dari and Pashtu language Bibles to the local Afghans, a blatant violation of CENTCOM's General Order 1-A. The video showed stacks of these Bibles on the floor, so they were undeniably there, despite the regulations prohibiting the shipping to Iraq or Afghanistan of any bulk religious materials contrary to Islam. "I am able to give them tracts on how to be saved, printed in Arabic. I wish I had enough Arabic Bibles to give them as well. The issue of mailing Arabic Bibles into Iraq from the U.S. is difficult (given the current postal regulations prohibiting all religious materials contrary to Islam except for personal use of the soldiers). But the hunger for the Word of God in Iraq is very great, as I have witnessed first-hand." Obviously, by citing the regulation prohibiting the materials he was passing out as something that was hindering his proselytizing, Capt. Mickel was admitting that he knew what he was doing violated regulations. "But the most amazing thing is that I was constantly led to stop and talk with Iraqis working at the Coalition Provisional Authority. I learned their names, became a part of their lives, and shared Jesus Christ by distributing DVDs and Arabic Bibles." The private organizations sending Arabic Bibles and those in other native languages into Iraq and Afghanistan are too many to count, and many boast of the help they get from military personnel to distribute these Bibles. Here are a few quotes from some of these organizations. "OnlyOneCross.com recently sent a case of Arabic Bibles to a Brother who is working in a detention center in Iraq." "Many young men in training at Fort Leonard Wood were converted to Christ. The Lord led us on to preaching in Army camps in the US, Korea, and the Philippines. We are now supplying Arabic Bibles for distribution by our troops in Iraq." "On another note, a dear Christian friend, that I had met some ten years prior, who was a deacon of an independent Baptist church in Missouri was also in Iraq. I was totally unaware of this. He was in the Missouri National Guard and holds the rank of Lieutenant Colonial. Col. Koontze immediately contacted me when he found out I was in country. He was made aware of my being in Baghdad by a pastor friend of his that he had spoken with in the states. "Through his command intelligence office, he located the hotel I was staying at. When he came to the hotel, I was sitting outside with the other pastors on the hotel's terrace, waiting for Robert Lewis [Global Resource Group-Director], who was going to meet with us that afternoon. Col. Koontze must have had 15-20 soldiers with him; they literally blocked off the entire city block with tanks and humvees to secure the area. He then walked into the lobby asking if anyone could tell him where Pastor Furse was. As he was saying those words, he spotted me and immediately said, "It's good to see you again Bro. Furse." At first, I did not recognize him, until he took his helmet off. We spoke for about 20 minutes at one of the tables on the terrace of the hotel; all the while the tanks and humvees were being lined up and down the main street in front of the hotel. After renewing acquaintances, I had to tell him that it would probably be best if he and his unit left as soon as possible. "The Iraqi people in the hotel and those on the street were to say the least, very concerned. I did not want to bring that much attention to the hotel; for fear that terrorists would target the area as well [over the previous four or five days, we had heard sporadic AK-47 gunfire going off just blocks away from the hotel]. 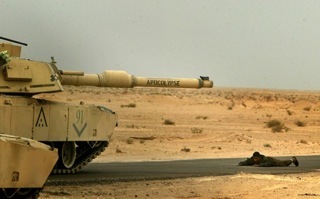 Col. Koontze agreed fully with me on that assessment and ordered his unit to leave quietly and as quickly as possible." "Actually, they're in Baghdad right now. Somehow the enemy tried to get 'em hung up there. There was a threat they were gonna get shipped back to the States and all that. We prayed, and they're gonna be picked up in a couple of days. God raised someone up right there in Baghdad that's gonna go -- a Christian colonel that's stationed there in Baghdad, and he's gonna go and get the Bibles..."
Last April, Soldiers Bible Ministry entered into an official partnership with an organization called Heart of God International Ministries. To announce this partnership, Heart of God International Ministries sent out an email about Soldiers Bible Ministry, featuring the Swahili Bible story as an example of the "supernatural things God is doing in Iraq." "Right now there are about 200 men from Uganda protecting 100 US Army soldiers in Iraq near Babylon. These men from Uganda have been having dreams, and these dreams have been of Jesus Christ as the Messiah which led them to begin asking questions about Christ to the Chaplain. Many of these former Muslims have come to Christ." "The signs of the times are all around us ... Jesus, the Messiah, is coming back soon. It is our responsibility to make sure every man, woman, and child has had the opportunity to meet the Lord Jesus Christ. Seize every opportunity to share the Good News ... seize this opportunity to put the Word of God into the hands of US troops and allied forces." In spite of their blatant violations of military regulations, Soldiers Bible Ministry is heartily endorsed by none other than the Army's Chief of Chaplains, Maj. Gen. Douglas Carver, with this statement on their website: "Thanks so much for your invaluable ministry of the Word to our Soldiers." In addition to Bibles, other Arabic language Christian books are being shipped into Iraq and Afghanistan for distribution by our troops. 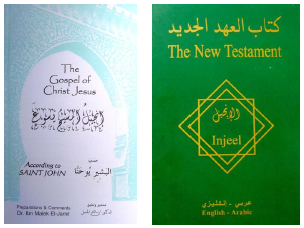 The January 2009 newsletter of Worldwide Military Baptist Missions, for example, included these images of their English-Arabic proselytizing materials. And, last, but certainly not least, there is Jim Ammerman, a retired Army colonel and conspiracy theorist who heads a Department of Defense authorized military chaplain endorsing agency called the Chaplaincy of Full Gospel Churches (CFGC), which currently endorses 270 military chaplains and chaplain candidates. MRFF has demanded, for a number of reasons, that the DoD investigate CFGC and revoke Mr. Ammerman's endorsing authority, as I wrote in a recent post titled "MRFF Demands DoD Revoke Authority of Chaplain Endorser Who Suggested Democrats Should Be Executed." Among the reasons for MRFF's demands is that Ammerman, working with an organization called the International Missions Network Center (IMNC), set up a network of forty of his chaplains serving in Iraq to receive and distribute Arabic Bibles in order to "establish a wedge for the kingdom of God in the Middle East, directly affecting the Islamic world," as he said in one of the CFGC's newsletters, and which IMNC called the "true reconstruction" of Iraq.